1980-08-08. New. Ships with Tracking Number! INTERNATIONAL WORLDWIDE Shipping available. Buy with confidence, excellent customer service! Arbor House, 1980-01-01. Hardcover. Used:Good. New York: Arbor House, 1980. First edition. 1 vols. 8vo. Cloth-backed boards. Fine, in Fine dust jacket. First edition. 1 vols. 8vo. Avon Books / Bard. PAPERBACK. 0380577453 New Condition. . New. Arbor House. Hardcover. 0877952833 New Condition. . New. Avon Books / Bard. PAPERBACK. 0380577453 Like New Condition. . Fine. 1980-08-08. Good. Ships with Tracking Number! INTERNATIONAL WORLDWIDE Shipping available. May not contain Access Codes or Supplements. May be ex-library. Shipping & Handling by region. Buy with confidence, excellent customer service! 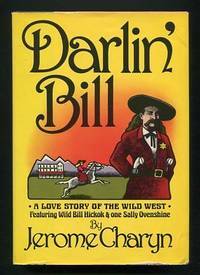 DARLIN' BILL: A Love Story of the Wild West. New York:: Arbor House,, (1980). Very near fine in a like dustjacket (remainder mark, corners slightly bumped). First printing. A love story of the Wild West featuring Will Bill Hickok and one Sally Ovenshine, a blending of fact and fiction, adventure and romance. INSCRIBED on the half title page to the late noted Oklahoma collector Larry Owens. 300 pp. New York: Arbor House. Near Fine in Near Fine dust jacket. 1980. First Edition; First Printing. Hardcover. 0877952833 . Signed by Charyn on the front free endpaper. Bookstore's signed label on the mylar cover. An imaginative account of the real-life love affair between Bill Hickok and Sally Ovenshine, in the adventurous days of the American West, follows the two lovers from their strange initial meeting through Hickok's violent death. ; Signed by Author . Arbor House. Hardcover. 0877952833 Like New Condition. . Fine. New York: Arbor House, (1980).. (1980).. Very good. SIGNED BY JEROME CHARYN - Octavo, cloth-backed boards in a dust wrapper. There is a tiny chip to the paper on the top edge of the front cover. The dust jacket spine is sunned & there is a shorr tear to the top edge of the front panel. Half-title, title & 300 pages. There is light foxing to the top & bottom edges. Near fine in a very good dust wrapper. <p>First edition.<p>Signed by the author on the front endpaper. Seller: Blue Mountain Books & Manuscripts, Ltd.
New York: Arbor House, 1980. Fine/Fine. Fine in fine dustwrapper. New York: Arbor House, 1980. First. hardcover. very good/very good(-). 8vo, 1/2 black cloth, d.w. lightly soiled. New York: Arbor House, (1980). First Editiion. A novel featuring Wild Bill Hickok. Signed by the author. 1980, 1st edition, 2nd printing, near fine condition, with a very good+ dust jacket, minor closed tear to dust jacket edge, with a priced unclipped dust jacket flap, published by Arbor House, New York, 300 pages. A fictional love story of the Wild West, featuring one James Butler "Wild Bill" Hickok and one Sally Ovenshine, [Calamaty Jane]. A hilarious read! . Arbor House, 1980. Very good in a very good dust jacket. New York: Arbor House. Near Fine in Near Fine dj. (c.1980). First Edition. Hardcover. 0-87795-283-3 . (price-clipped) [tight clean copy, bottom corners bumped; jacket shows minor wear along bottom edge, small tear at lower rear corner]. The book "recreates--and reincarnates--the life of the legendary hero of the wild West, James Butler Hickok--also known as 'Wild Bill'--whose much-bandied exploits as daring Union spy, ruthless Indian fighter, inveterate gambler and ladies' man spread his fame and infamous fortune throughout the land and straight into the heart of the story's fictional heroine, one Sally Ovenshine, Bill's sensitively conjured lover." . New York, NY, U.S.A.: Morrow/Avon, 1980. Book. Very Good. Hardcover. SECOND PRINT. 8vo - over 7¾" - 9¾" tall. 300 PAGES. YELLOW DUST JACKET LIGHTLY WRINKLED. HARDCOVER BOOK IS CLEAN AND SECURE Morrow/Avon. 1980, SECOND PRINT. 8vo - over 7¾" - 9¾" tall. hardcover. 8vo, cl.-backed bds., d.w. N.Y., (1980). First edn. A novel featuring Wild Bill Hickok. New York: Arbor House, 1980. Jacket has light edgewear. Boards have minor shelfwear. Pages are clean, text has no markings, binding is sound. . Hard Cover. Very Good/Very Good. 8vo - over 7¾" - 9¾" tall. Arbor House, 1980. Hardcover. Good. Avon Books / Bard. Used - Good. Shows some signs of wear, and may have some markings on the inside. NY: Arbor House, 1980. Hardcover. F/F. 1st edition, 1st printing.. Top corners are lightly bumped. Jacket has a one inch tape repaired closed tear at bottom of front panel. We offer a LIFETIME GUARANTEE. See KHBOOKS for details. NY: Arbor House. Very Good. 1980. First Edition. Hardcover. 0877952833 . Heavily Chipped, Faded . Arbor House, 1980. Book. Near Fine. Hardcover. 2nd Printing. F/F. Price-clipped. NEW YORK: ARBOR HOUSE. Very Good+ Bright tight condition Very good dustjacket. 1980. 1st edition. ISBN 0-87795-283-3 . Arbor House. Collectible - Very Good. First edition copy. Collectible - Very Good. Very Good dust jacket. Arbor House. Used - Very Good. Very Good condition. Good dust jacket. Plume. Used - Acceptable. Acceptable condition. Avon Books / Bard, 1982. Some edgewear, slight bowing, paper browning a bit - a good, clean, tight copy.. 1st. Mass Market Paperback. Good. Arbor House. Hardcover. GOOD. Spine creases, wear to binding and pages from reading. May contain limited notes, underlining or highlighting that does affect the text. Possible ex library copy, thatâll have the markings and stickers associated from the library. Accessories such as CD, codes, toys, may not be included.